Blackbeltjones & Api making pancakes at Korjaamo at the Helsinki Flickr meetup. 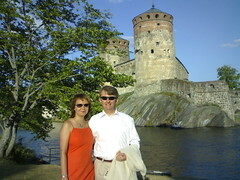 Nokia offers its employees a two-for-the-price-of-one deal each year at the Savonlinna Opera Festival, which is held in the Olavinlinna castle. Eve & I just saw Offenbach’s ‘Tales of Hoffmann’, which was, well, opera. 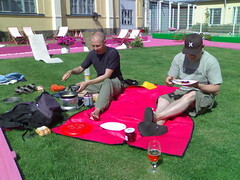 ‘Nuff said; now we’re in the ‘Huvila’ brewery pub, so the evening is getting better all the time :). Ella & Eve met at the park after work. We’ve just finished our barbeque at Eve’s mum’s, and now we’re relaxing on the jetty. 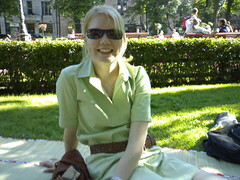 It’s not as hot as it was in France, but still very pleasant. It’s strange to think that we’re still in Helsinki city, though we’re reminded every few minutes by a metro train crossing a bridge in the distance. 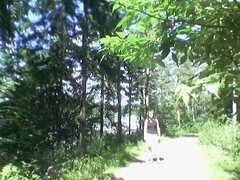 We’re on the way to Eve’s mother’s place – this is the scenic route through the nearby forest. 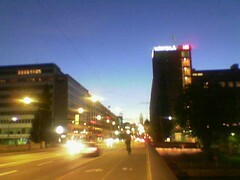 The building in centre background is our home. 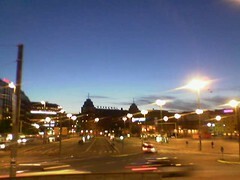 This photo shows how in mid-summer it never really gets dark in Helsinki. You could easily read a book by this light. On my way back from Cindy’s Canada Day celebrations, I can’t help noticing how the northern sky is still so bright blue.